Hampton Inn New Orleans/Garden District Hotel is located in the heart of the Garden District on the St. Charles Streetcar line. We are only minutes from Tulane and Loyola University, Audubon Park/Zoo, Downtown and the French Quarter. Within 2.5 miles you can dine at Houston's, Cannons, Copeland's, Pascal Manale's, Commander's Palace, Upperline, K-Paul's, McDonald's, Antoine's and many more. We feature a courtyard area with pool, complimentary on site parking, same day dry cleaning (M-Sat. ), and voice mail. 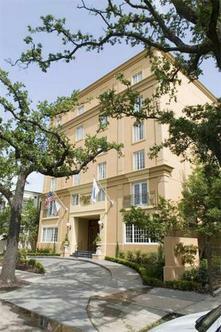 Our studio suites include whirlpool bathtubs, sleeper sofa, double sinks and view overlooking St. Charles Avenue. We offer complimentary breakfast buffet with hot items, complimentary tea and cheese reception every evening, complimentary high speed internet access, unlimited local phone calls, turn down service, in-room hair dryer, coffee maker and iron/board, and TV with cable. We also offer connecting rooms and cribs. Roll-away beds, laundry/valet services, meeting/banquet facilities and audio visual equipment are available for a nominal fee.